I love eating dessert so I'm always on the hunt for new and exciting sweet treats to try! I've been eating So Delicious ice cream sandwiches for a while now, and I'm also a huge fan of the So Delicious dairy free Coconut milk yogurts (I love the taste of coconut milk in yogurt instead of regular milk). 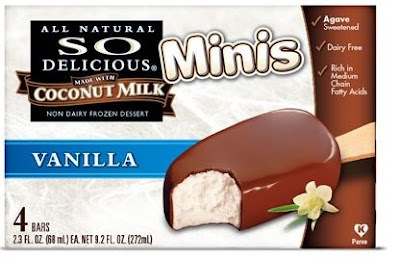 So, when I saw that So Delicious had come out with a dairy free coconut milk based vanilla chocolate bar, I was excited to try it! The bar looks just like the picture, and it also tastes just as good as it looks. The coconut milk base gives the ice cream a subtle coconut flavor and the chocolate coating is quite sweet and crunchy. The bar itself is all natural, and it is sweetened with agave syrup and beet sugar. I find this bar much more satisfying and flavorful than the similar low calorie, less natural low calorie bars like this at most supermarkets. In the calorie department, each bar is 150 calories, 7 grams of fat (from the coconut, so it isn't bad fat), 3 grams of fiber, and 1 gram of protein (so 3 weight watchers points). Definitely worth it considering their great taste. that's my fav type of ice cream bars, ice cream inside and chocolate cover! :D I'll definitely look for it! Hi Juliet, thanks for sharing this! I haven't seen these at the store yet, but I can't wait! I, too, love the coconut soy yogurt, so I'm sure these will be delicious. I have a question though-- it was my understanding that coconut contained a high level of saturated fat, and even though it's plant-derived, it's still a "bad fat" (as opposed to unsaturated and polyunsaturated fats). Do you know something different? I'm not a big fan of coconut, but for the calories cost and the yummy picture, I just might have to try. Hopefully my grocer sells them! Hi Bernadette -- Great question! So, there is no scientific definition of healthy, but coconut fat is made primary of medium chain triglycerides (which as you point out is a saturated fat). However, medium chain triglycerides are more water soluble and are much more likely to be burned off quickly (they are a good energy source) and absorbed by the body vs. other saturated fats. There is a nice article on wikipedia about them if you want to learn more! Thanks for the q! Oh wow, thanks so much for sharing about this. I'm going to keep on the lookout for these!! yay! now that I can't eat dairy i needed a substitute for the healthy choice ones. YUM! OOh I have not seen these, but I will be on the lookout. I love their little ice cream sandwiches. I keep seeing those at the store. Now I'll have to pick some up. Good recommendation.